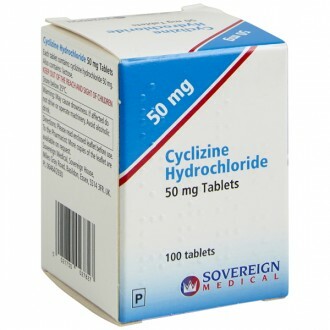 Cyclizine is a generic medication that treats nausea caused by travelling, vertigo, inner and middle ear problems, radiotherapy treatment, or following surgery where general anaesthetic has been used. The medication is an antihistamine and contains the active ingredient, cyclizine hydrochloride. Fill in our confidential questionnaire and your medication could be with you tomorrow. Nausea causes a sick feeling in the stomach and can affect anyone, though people diagnosed with migraines are often more susceptible. 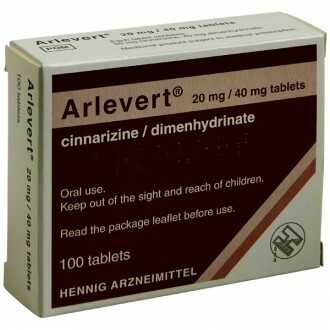 Cyclizine tablets treat those who experience nausea due to problems with the middle or inner ear. The ear’s vestibular area consists of chambers, fluid and nerves that transmit information to the brain and help it form a picture of the body’s movement and balance. These messages usually correspond with those delivered by the eyes and muscles. However, if these messages contradict each other, the brain can become confused which prompts the vomiting centre to signal feelings of nausea. The reaction can be caused by car, plane or boat travel or by repeated motion. If motion causes your nausea, try these techniques: keep still, sit in fresh air, follow the horizon, listen to music and try to relax. Some find that ginger-based products are also effective at reducing nausea. Unfortunately, these practices may not work for everyone. In such cases, medication may be required. Cyclizine antihistamine tablets can combat symptoms of nausea and are available through our online pharmacy. Cyclizine works to block receptors in the brain’s vomiting centre and prevents them from receiving signals from the vestibular area. This stops the vomiting centre from reacting and prevents the feeling of nausea. If treatment with Cyclizine does not improve your condition, you should consult your doctor. Take one tablet up to 3 times a day when necessary. Do not take more than one tablet at a time or more than 3 in 24 hours. irregular heartbeat; constipation; heartburn; feeling sick; vomiting; difficulty urinating; diarrhea; loss of appetite; restlessness; nervousness; euphoria; stomach pain; ringing in ears; difficulty sleeping; hallucinations. Lactose, potato starch, acacia and magnesium stearate. you have had an allergic reaction to Cyclizine or any of its ingredients. you have been drinking alcohol. Cyclizine’s anti-vomiting properties may increase the toxicity of alcohol. Children under 6 should not use Cyclizine. have an obstructive bowel condition. suffer from phaeochromocytoma, a tumour of the medulla on the adrenal glands. suffer from an enlarged prostate gland. have been told your heart is not working properly. suffer from porphyria, an inherited disorder which can lead to sensitivity to sunlight. medications for depression, anxiety or difficulty sleeping. Please read all packaging and the Product Information Leaflet before taking any new medication and inform your doctor of medication you take or intend to take. Cyclizine is an antihistamine that is used to treat and prevent nausea and vomiting. 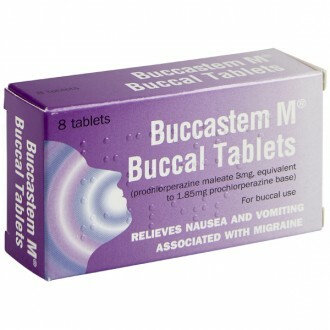 It can be used to nausea associated with travel sickness, vertigo and inner ear infections. Cyclizine helps to block nausea signals reaching the brain. The vomiting centre and the CRT (chemoreceptor trigger zone) are responsible for nausea and vomiting. Cyclizine blocks messages from other parts of the body, such as the inner ear, reaching these areas in the brain and prevents them from being activated. How do I take Cyclizine? One tablet can be taken up to 3 times a day as required. Cyclizine can be taken with or after food. Cyclizine can be taken one to two hours before travelling if used for motion sickness. It can also be taken before emergency contraception (the 'morning-after pill') if it makes you feel sick. Is it safe to use Cyclizine continuously? Cyclizine can be taken on a when required basis and it is not necessary for it to be taken continuously for it to have an effect. Its effects will not diminish over time if taken continuously. Should you need to take the medication three times a day, every day we would recommended you speak to a doctor to ensure there is no underlying cause that needs to be addressed. When you buy Cyclizine online it is important to have a check-up with your doctor to ensure that any underlying condition that causes nausea is being properly addressed. What are the side effects of Cyclizine? The most common side effects of Cyclizine include: drowsiness, headache, dry mouth, blurred vision and constipation. Medication can affect different people in different ways. It is important to read and familiarise yourself with the full list of side effects in the patient information leaflet before you take Cyclizine. You may not experience the side effects listed. How long will it take for Cyclizine work? Cyclizine will start to work in as little as 30 minutes and the effects last for four to six hours. Cyclizine can be taken up to three times a day when it is needed (roughly six hours apart). If you miss a dose then you should take it when you remember unless it is nearly time for your next dose. Do not take two at the same time to make up for the missed dose. Always keep at least six hours between doses. Can I take Cyclizine and drive? The most commonly reported side effects of Cyclizine include drowsiness and blurred vision. If you experience either of these then driving or operating heavy machinery should be avoided. Is Cyclizine suitable during pregnancy and breast-feeding? There has been no data to determine the safety of cyclizine in pregnancy or during breast-feeding. It is not recommended to be taken during pregnancy or breast-feeding unless under strict instruction from your doctor. Can I take Cyclizine with other medication? One of the most common side effects with Cyclizine is drowsiness. Taking Cyclizine with other medications that can also cause drowsiness, will make the drowsiness worse. Examples of these include alcohol, sleeping tablets and antidepressants. For this reason it is best to avoid alcohol when taking this medication. Cyclizine also may cause anitmuscunrinic side effects like blurred vision, constipation and a dry mouth. If it is taken with other antimuscurinic medication, these effects will also worse. Examples include antidepressants, Parkinson’s medication and antihistamines. Ensure you read the full list of warnings and interactions before you take Cyclizine.